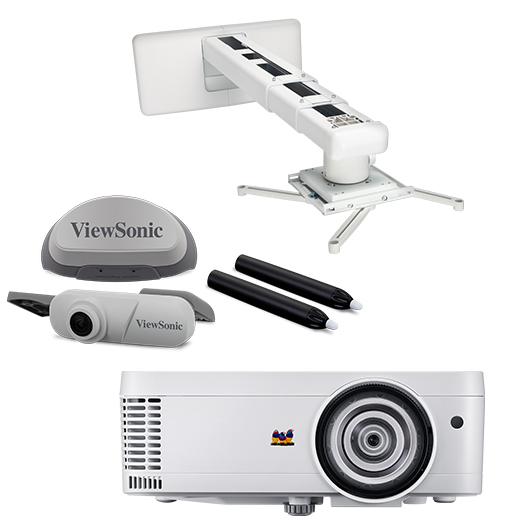 One easy price includes a ViewSonic® projector, interactive module, and wall mount kit, so you get everything you need for interactive projection. Camera seamlessly attaches to projector with included mount and connects to laptop via USB table. Mount the laser curtain module above your screen with the included magnets, screws or Velcro sticky tape. Fire up the projector and the auto calibration function launches with a single click and completes in under a minute. Make it easy on yourself today! Contact your ViewSonic representative to get this great deal!